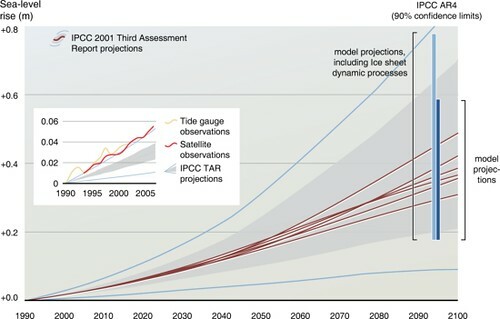 The projected range of global averaged sea-level rise from the IPCC 2001 Assessment Report for the period 1990 to 2100 is shown by the lines and shading. The updated AR4 IPCC projections made are shown by the bars plotted at 2095, the dark blue bar is the range of model projections (90% confidence limits) and the light blue bar has the upper range extended to allow for the potential but poorly quantified additional contribution from a dynamic response of the Greenland and Antarctic ice sheets to global warming. 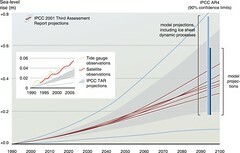 Note that the IPCC AR4 states that “larger values cannot be excluded, but understanding of these effects is too limited to assess their likelihood or provide a best estimate or an upper bound for sea-level rise.” The inset shows the observed sea levels from tide gauges (orange) and satellites (red) are tracking along the upper bound of the IPCC 2001 projections since the start of the projections in 1990.